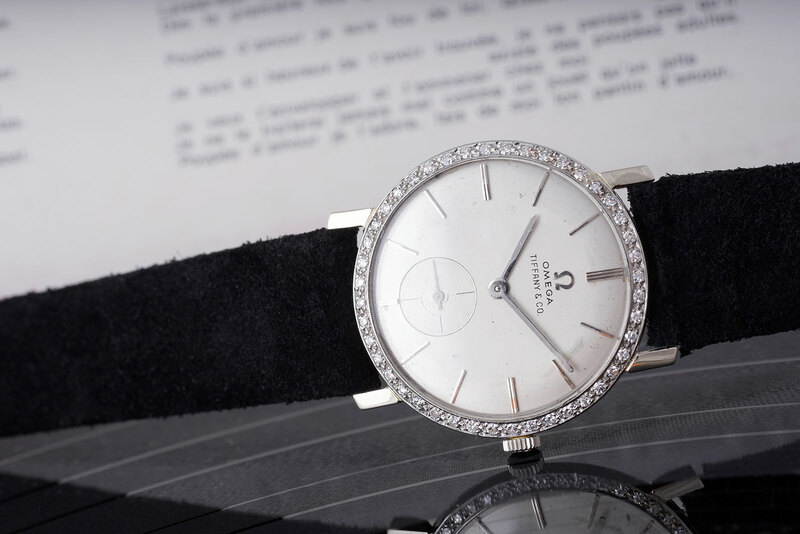 While it was the usual quartet, Antiquorum, Christie’s, Phillips and Sotheby’s, that held their watch auctions over three days last week, the spring Geneva auction season was likely the biggest to date. 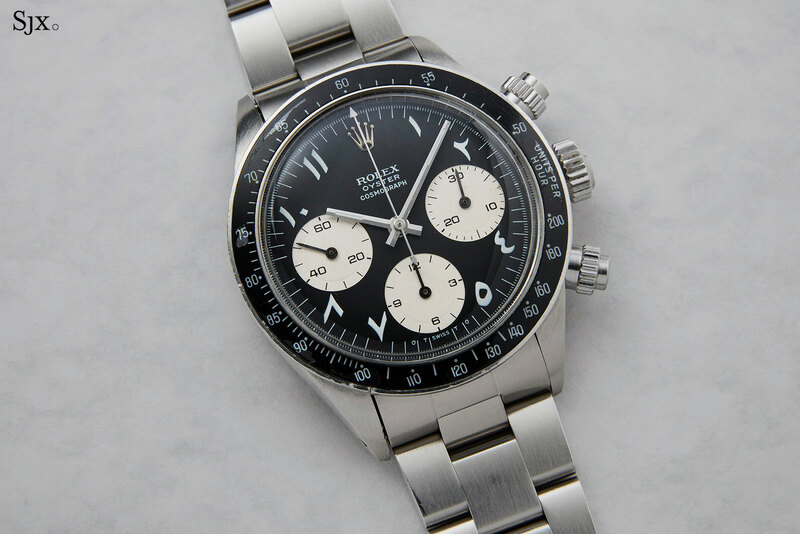 Phillips alone claimed a tally that would have exceeded the entire market’s sales just a few years ago, selling SFr45m of watches over the weekend, with over SFr22m for Daytona Ultimatum alone. While the numbers are big and exciting, several observations made during the auctions point to a more nuanced picture with some important takeaways. It was notable that there seemed to be fewer dealers bidding at all the auctions than in past sales – typically most of the bids in the room at all the auction houses are from dealers – which might indicate two scenarios, which also appear to have been confirmed by anecdotal evidence in conversations with insiders. One is that prices are high enough that dealers can no longer make a margin, or have no need to support prices to maintain the value of their inventory. The other is that dealers already have substantial inventory on hand, built up in anticipation of higher prices. For one, there’s often an explanation behind surprise results, something illustrated by the trio of record-setting prices for Omega watches at Phillips. An Omega Speedmaster ref. 2915-1 sold for SFr408,500, while the Alaska III prototype ref. ST 188.0002 went for SFr162,000. And then there was one of the big stars of the sale, with Elvis Presley’s Omega selling for SFr1.8m. A few factors put those numbers into perspective. Both the Speedmaster and Alaska III were observed to have been won by the same collector bidding in the room. The gentleman is presumably a massive Omega fan. And the price for the Elvis Omega starts to make sense if thought about another way, and not merely for a bit of public relations value. Imagine if Omega were to launch a De Ville Master Co-Axial “Elvis Presley”, limited to 200 pieces and priced at SFr28,000. That’s SFr2.8m in revenue, with the bulk of the profit retained by Omega if it were to be sold only at boutiques. Phillips’ Daytona auction was the best attended of the weekend, with a room packed to capacity, with almost as many people standing as sitting. Despite the huge total, the Daytona sale appears to have disappointed some industry insiders. Rolex expert Philipp Stahl, writing on his blog Rolex Passion Report, predicted a total in excess of SFr30m, compared to the SFr22m achieved. The reality was, once again, more nuanced. A good number of lots outperformed, especially the contemporary, Zenith El Primero-powered Daytonas. All four of them comfortably crossed the SFr150,000 mark, with three closing in on SFr200,000. This probably means this category of Daytonas will continue its rise. A handful of vintage Daytonas underperformed relative to estimates, perhaps because they are too exotic. 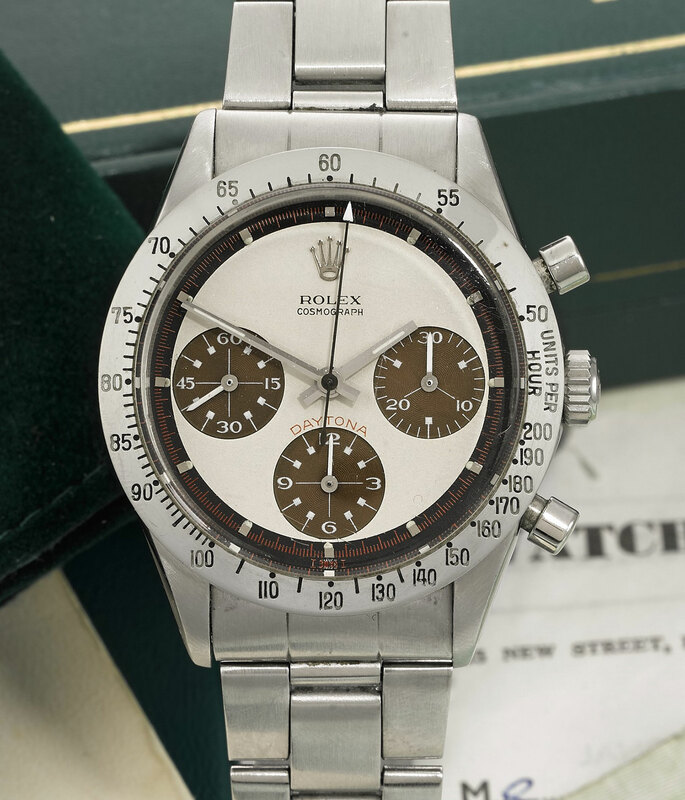 The Daytona with Eastern Arabic hour numerals sold at the low estimate with little bidding action, as did the ref. 6240 “pre-Paul Newman”. The sale also illustrated more prosaic factors in determining prices. The importance of the ambience was pronounced during Daytona Ultimatum, which began at 4pm on a sunny day inside a tent set up on the lawn of the La Reserve hotel. Filled to the brim, the physical temperature of the sale room rose swiftly, while most of the audience were dressed for cooler weather, creating a warm and somewhat somnolent atmosphere. It’s not hard to conceive bidding would have been more vigorous if the mercury had dropped a few degrees, as it did on the second day of the Phillips auction. 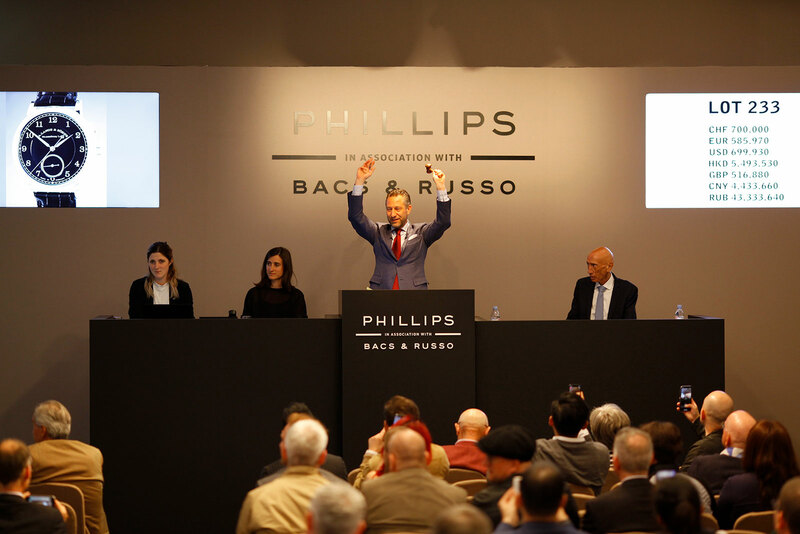 The Phillips auction is the most talked about, not only because of the watches and results but also because the event is a show, and auctioneer Aurel Bacs is showman. Much of it was extremely good theatre, with dramatic crests and lulls in the room as the action took place. Just as crucial is the fact that Phillips is all about watches, while Sotheby’s and Christie’s have bigger business to do in other categories. Christie’s jewellery and gemstone auction a few days after its watch auction brought in over SFr81m, which is more than the watch sales of all the auction houses put together, despite it being a relative low total for a jewellery sale. For all the big ticket lots, there are also segments of the market that seem to be leaking air ever so gently. Prices for vintage Heuer have come off significantly from their peak. Phillips sold a Heuer Solunagraph ref. 2446SF for SFr21,250 over the weekend, while a year and a half ago the same model in comparable shape went for SFr50,000 at the Heuer thematic sale. The same can be said for vintage Panerai, which has been trending downwards for even longer. For every anticipated hit there are usually a handful of watches that sell for high enough prices that leaves everyone scratching their heads. Lot 189 at Phillips is a perfect example. It’s a Patek Philippe ref. 3585, a “backwinder” with the crown on the case back, and the automatic cal. 350 inside that has an unusual peripheral rotor (that never worked very well). This example was 18k yellow gold, cushion-shaped, fitted with a textured blue dial, and estimated at SFr4000 to SFr6000. In shape and style it is not considered fashionable. After rapid and enthusiastic bidding, it sold for SFr37,500 with fees to a phone bidder. It was a result neither god nor Aurel Bacs could fathom. Not only prices can surprise, but even unexpected bids that can change the tenor of the bidding. During the bidding for the steel Lange 1815 ‘Tribute to Walter Lange’, the frenzied bidding between parties and phones in the room was suddenly throw off course by a single bid of SFr665,000 from an anonymous internet bidding in Thailand. After a brief pause that appeared to provide renewed impetus to the bidders, and the watch hammered for SFr700,000, or SFr852,500 with fees. Another notable result was the “tropical” Rolex Daytona ref. 6239 at Sotheby’s, which soared to SFr951,000, fees included. That single watch was almost one-sixth of Sotheby’s entire auction total. Ordinarily a SFr200,000 watch on a good day, it was helped by its sub-dials that had degraded to a pleasing caramel colour, as well as a strong backstory from the original owner, who consigned the watch to Sotheby’s. Bidding for the watch eventually boiled down to two anonymous clients on the phone, represented by Daryn Schnipper and Sam Hines respectively. Based in London and having been at Sotheby’s almost 38 years, Ms Schnipper is now Chairman, International Watch Division, and one of the handful of senior auctioneers in the industry who is a peer of Antiquorum founder Osvaldo Patrizzi. Against her was Mr Hines, who hails from London but is now based in Hong Kong as Sotheby’s Worldwide Head of Watches. Though he has been in the watch business some 20 years, Mr Hines is still under 40 years old with a strong roster of Asian clients. Ms Schnipper won the battle for the tropical Daytona, but it would appear that the future lies with young collectors in Asia.